This introduction is intended for new users, or users who never consulted the documentation but encountered blockers after guessing successfully their first steps through the API. It is assumed here that the rpy2 package has been properly installed. This will be the case if working out of one of the Docker containers available, of if the instructions were followed (see Installation). rpy2 is like any other python package binding to a C library. Its top level can be imported, and the version obtained. The rpy2 version is rather important when reporting an issue with rpy2, or in your own code if trying to assess whether rpy2 is matching the expected version. The high-level interface is trying to make the use of R as natural as possible for a Python user (something sometimes referred to as “pythonic”), and this introduction is only coverage that interface. R is arguably one of the best data analysis toolboxes because of the breadth and depth of its packages. Importing R packages is often the first step when running R code, and rpy2 is providing a function rpy2.robjects.packages.importr() that makes that step very similar to importing Python packages. In essence, that step is importing the R package in the embedded R, and is exposing all R objects in that package as Python objects. There is a twist though. R object names can contain a “.” (dot) while in Python the dot means “attribute in a namespace”. Because of this, importr is trying to translate “.” into “_” . The details will not be necessary in most of the cases, but when they do the documentation for R packages should be consulted. Knowing how to install R packages is an important skill to have, although not always a mandatory one if working out of an R installation designed to meet all reasonable needs for a task or a project. Package installation is presented early in the introduction, but this subsection can be skipped if difficulties such as an absence of internet connection, an uncooperative proxy (or proxy maintainer), or insufficient write priviledges to install the package are met. Downloading and installing R packages is usually performed by fetching R packages from a package repository and installing them locally. Capabilities to do this are provided by R libraries, and when in Python we can simply use them using rpy2. An interface to the R features is provided in rpy2.robjects.packages (where the function importr() introduced above is defined). # Selectively install what needs to be install. # We are fancy, just because we can. The code above can be part of Python code you distribute if you are relying on CRAN packages not distributed with R by default. More documentation about the handling of R packages in rpy2 can be found Section R packages. We mentioned earlier that rpy2 is running an embedded R. This is may be a little abstract, so there is an object rpy2.robjects.r to make it tangible. This object can be used as rudimentary communication channel between Python and R, similar to the way one would interact with a subprocess yet more efficient, better integrated with Python, and easier to use. The __getitem__() method of rpy2.robjects.r, gets the R object associated with a given symbol, just as typing that symbol name in the R console would do it (see the note below for details). Under the hood, the variable pi is gotten by default from the R base package, unless an other variable with the name pi was created in R’s .globalEnv . Whenever one wishes to be specific about where the symbol should be looked for (which should be most of the time), it possible to wrap R packages in Python namespace objects (see R packages). For more details on environments, see Section Environments. The object r is also callable, and the string passed in a call is evaluated as R code. The simplest such strings would be the name of an R object, and this provide an alternative to the method __getitem__ described earlier. More complex strings are R expressions of arbitrary complexity, or even sequences of expressions (snippets of R code). Their evaluation is performed in what is known to R users as the Global Environment , that is the place one starts at when in the R console. Whenever the R code creates variables, those variables are “located” in that Global Environment by default. For example, the string below returns the value 18.85. That string is a snippet of R code (complete with comments) that first creates an R function, then binds it to the symbol f (in R), finally calls that function f . The results of the call (what the R function f is returns) is returned to Python. The function r_f is callable, and can be used like a regular Python function. Jump to Section Calling R functions for more on calling functions. Against the first impression one may get from the title of this section, simple and handy features of rpy2 are presented here. An R object has a string representation that can be used directly into R code to be evaluated. 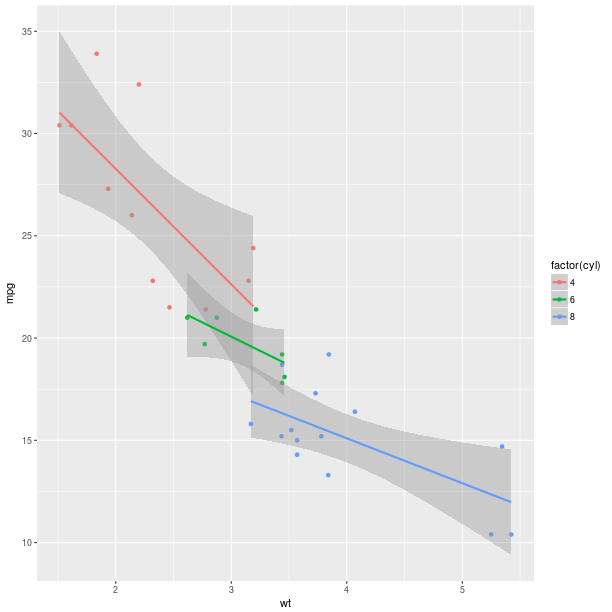 In R , data are mostly represented by vectors, even when looking like scalars. When looking closely at the R object pi used previously, we can observe that this is in fact a vector of length 1. As such, the python method add() will result in a concatenation (function c() in R), as this is the case for regular python lists. There is much that can be achieved with vectors, having them to behave more like Python lists or R vectors. A comprehensive description of the behavior of vectors is found in robjects.vector. R matrixes and arrays are just vectors with a dim attribute. By default, calling R functions return R objects. More information on functions is in Section Functions. R has a builtin help system that, just like the pydoc strings are used frequently in python during interactive sessions, is used very frequently by R programmmers. This help system is accessible from an R function, therefore accessible from rpy2. The help message so produced is not a string returned to the console but is directly printed by R to the standard output. The call to str() only returns an empty string, and the reason for this is somewhat involved for an introductory documentation. This behaviour is rooted in R itself and in rpy2 the string representation of R objects is the string representation as given by the R console, which in that case takes a singular route. For a Python friendly help to the R help system, consider the module rpy2.robjects.help. As before with help , the result can be printed / converted to a string, giving a similar result to what is obtained from an R session. The data structure returned can otherwise be used to access the information returned in details. However, this is beyond the scope of an introduction, and one should master the content of the module robjects.vector before anything else. This section demonstrates some of the features of rpy2. Setting dynamically the number of arguments in a function call can be done the usual way in python. More about plots and graphics in R, as well as more advanced plots are presented in Section Graphics. By default, the embedded R open an interactive plotting device, that is a window in which the plot is located. Processing interactive events on that devices, such as resizing or closing the window must be explicitly required (see Section Processing interactive events). This way to perform a linear fit it matching precisely the way in R presented above, but there are other ways (see Section Formulae for storing the variables directly in the lookup environment of the formula). Q: Now how to extract data from the resulting objects ? A: Well, it all depends on the object. R is very much designed for interactive sessions, and users often inspect what a function is returning in order to know how to extract information. More about extracting elements from vectors is available at Extracting items.